The European release of "DSU" gives us the chance to interview Alex Giannascoli, a.k.a. 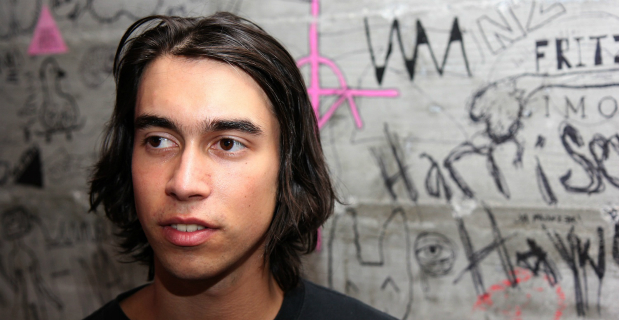 Alex G., the talented singer/songwriter from Philadelphia. "DSU" is out on November 10th trough Lucky Number. Hi Alex! Thanks for taking a bit of your time to answer our questions. How's to go from being Internet's best kept secret to record an album so well welcomed all over the world? Do you feel comfortable in receiving all these positive attention? I think it’s fine. I try not to think about it too much. You grew up in the Philadelphia area and now you're attending Temple University. American colleges have always been a breeding ground for new bands. Tell us your experience as a musician in college. I read that you prefer to work alone, but you still need someone to play live gigs.. I don’t think college really affected me as a musician. I have been making music the same way since I was a kid. I have been playing shows with my childhood friend, Sam, for years. The other guys in the band I’ve met more recently, but not through school. You are very young and extremely prolific. Before releasing DSU through Orchid Tapes, you've recorded a lot of music, including four albums, all available on your Bandcamp. What can you say us about those songs? I think there's great material there. Dig into your Bandcamp is a fantastic experience. Songs like "Kut"e or "Crab" .. I love them! Do you think they will ever be "officially" released one day or the other? I don’t know if they will ever be released. I like all my songs equally. For some of the older releases I was less skilled at recording and playing, but I still put forth the same amount of effort then as I do now. Looking from outside, join the Orchid Tapes seems like joining a big family. Is this true? Knowing their mission, it looks like a natural choice for you. By the way, your album sold out in no time. Everyone in Orchid Tapes is very supportive and proactive. I’m glad I released DSU with Warren. Do you feel represented by the definition of bedroom-songwriter? I know is so overused, but it's actually the one which describes you better. I don’t really. I consider myself a songwriter, but I don’t like being confined by the term “bedroom”. It seems irrelevant. What lies behind your polyhedral music? You're frequently compared to huge names like Built To Spill or Elliott Smith. Is something that flatters you or is more a burden? Meet people's expectations is harder than ever now. They played a really important role in your musical education? I listened to Elliott Smith a lot when I was younger, so it seems natural that my music might reflect his sound. I never really listened to Built To Spill. I just try and make the best music I can. Your lyrics reflect sometimes an adolescent restlessness. As if you're afraid to grow up. How much creative energy is given to you from being a post-teenager? I'm thinking how a song like "Change" works at the same emotional level both in Philadelphia and across the Ocean, in an Italian suburb. It’s the same feel. Have you ever thought about your music as if it was something like a Bildungsroman? I just make music that is meaningful to me. I guess that is what makes it accessible for other people. When I listen to some of the older stuff and think of how it compares to my mindset now- it does seem something like a Bildungsroman. You can think about my music however you want. How's the tour going? Now that your album will be released in Europe, I guess there will be also an European tour. Among other things, your name suggests your Italian heritage. So we want you here at least for a couple of dates. Last thing: the cover was drawn by your sister, right? I love it. When DSU came out, I was doing the rewatch of Friday Night Lights and this probably has helped me to enjoy the record even more. What's the story behind it? Yes, Rachel painted it. She dreamt about that image and we decided it would make a good album cover. She is a great artist.